The kick-off of the third night of the DNC convention looks similar to the last two nights — each has been ushered in with one special singer's rendition of the national anthem. So far it's been Bobby Hill who's a member of Philadelphia's Keystone State Boychoir, and next it was Timmy Kelly, affectionately known as the Eagles' "good luck charm" based on their success rate after his voice opens their games. And Wednesday's DNC anthem singer, Sebastien de la Cruz's is just as talented. Cruz is a natural-born American citizen from San Antonio, Texas, who loves to sing mariachi tunes and has also been called upon at times to sing America's national anthem at public events. Cruz also performed at the Democratic debate in Miami.Whatever category of song he's performing though, he typically wears elaborate, traditional, gilded ensembles earning him the nickname, "El Charro de Oro" (or Golden Cowboy), as a nod to his cultural heritage. He started performing to raise money for his sick brother, according to NBC Latino. 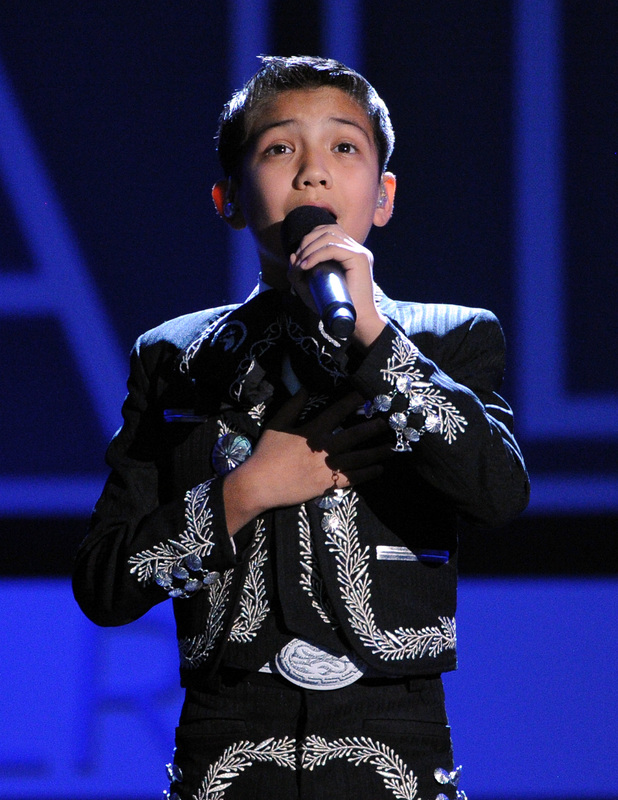 And he first got national attention on ABC's America's Got Talent singing the traditional Mexican ballads. Cruz's performances didn't stir the proverbial pot when they existed in the vacuum of the variety show, but his clothing choice got xenophobes all riled up when in 2013 at the NBA finals, the then 11-year-old was bombarded with hate-speech via social media. What could have been a moment to accept the cultural staple into America's consciousness, turned instead into nasty, vitriolic hate-slinging. Not only is the response ugly and hateful, but the accusations of Cruz being in the country illegally are categorically unfounded. Cruz is born in America and also shared his family's sacrifice for the country explaining, "My father was actually in the [U.S.] Navy for a really long time. People don’t know; they just assume that I’m just Mexican. But I’m not from Mexico. I’m from San Antonio, born and raised." In every instance, Cruz's response has been unprecedentedly gracious, proving to be even more mature than the current Republican presidential nominee, letting the insults roll off his back, avoiding reciprocal name-calling and instead reacting in a CNN interview to the hateful remarks, "It's not hurting me. It's just your opinion"
And Cruz will keep singing his country's anthem, and he'll do so beautifully, as he proved Wednesday night at the DNC.